You may have heard of the goji berry, a fruit that is native to China, due to its mass exodus to the Western world of late. Like most foods that are naturally high in antioxidants, the goji berry is thought to have restorative and healing powers that could help to stave off serious ailments like heart disease and cancer, just to name a couple. You can see why this incredible fruit has gained such popularity around the globe. So it’s not that surprising that Gojee, Inc. chose to use the name and image of this berry for their foodie website, of which the claim to fame is that it can point you towards recipes for food and drinks that use the ingredients you happen to have on hand. If you’re trying to figure out what you can do with pepper, canned peaches, and liquor, all you have to do is input them and the website will spit out a recipe for Peach and Black Pepper Margaritas. 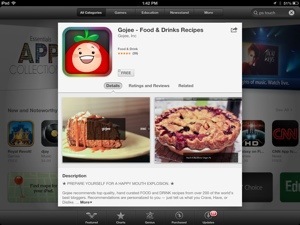 And now Gojee has taken the next step by turning their big idea into an app that goes anywhere. The descriptor for this app solicits users with the phrase, “Prepare yourself for a happy mouth explosion.” Odd phrasing aside, this could be just what the app delivers, in a sense. If you want to create something mouthwateringly delicious, it stands to reason that all you have to do is choose the ingredients you love and see what kind of flavor explosion the app comes up with. But there’s more to it than just scouring your cupboards for some canned food that’s been hibernating on the top shelf for a year so that you can see what recipes the app delivers. It can also help you to satisfy food cravings. You can actually search in three ways, by “have”, “crave”, or “dislike”. All will help to narrow down your options. For example, you could say you’re craving dessert to get a listing of sweet recipes. And you could further say that you have strawberries and that you dislike coconut. This will help get you to a recipe that’s just right to satisfy your current hunger or thirst. With recipes hand-selected by more than 200 foodie bloggers you’re sure to find some that you like, and they can be saved to your favorites list or shared with family and friends. Beautiful photos will have your mouth watering in no time and the fact that the app also caters to selective diets (vegetarian, vegan, gluten-free, and non-alcoholic) it has built-in appeal. Of course, the main thing that the company aims to offer (aside from fantastic recipes) is inspiration; they want to make sure that you never open your fridge and opt to call your Texas or Georgia pizza delivery service because all you’ve got on hand is celery, cottage cheese, and a can of Spam. Gojee wants you to approach your food with a sense of adventure and come up with an amazing meal every time. And if that’s not enough to convince you, maybe the fact that the app is free will prompt you to give it a whirl. Said one happy customer, “Gojee turned me into a cook.” It may not restore your body like the antioxidant power of its namesake, but it could just restore fun to your kitchen.